With its fast heating and consistent performance, the FWE “Clymate IQ ®” Model PHTT-12 Heated Holding Cabinet is a perfect choice for schools. Q. What challenges you do see currently facing K-12 foodservice? Gina Fero: I think the biggest problem is that we don’t know what the new administration’s going to do with current [school lunch] programs. There’s a lot of talk about block grants, which could really negatively affect the program because every state would be running their own program. The new meal pattern is also tough. We need to be feeding the kids food that we know they’ll eat and that’s always a challenge. You need good equipment to be able to do that. Q. How are students’ tastes changing? GF: Kids have been to the local malls, universities and stadiums. They have a more sophisticated palate and they know what they like. Q. Are you seeing more schools do their prep and cooking ahead of time and rethermalizing later? 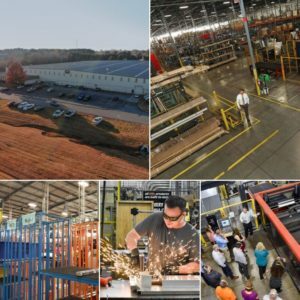 GF: I see more and more districts creating a few “fast-scratch” signature items, and that sometimes involves rethermalizing and holding. There’s no way that you could make something fresh in 20 minutes for anywhere from 300 up to 800 students. Q. 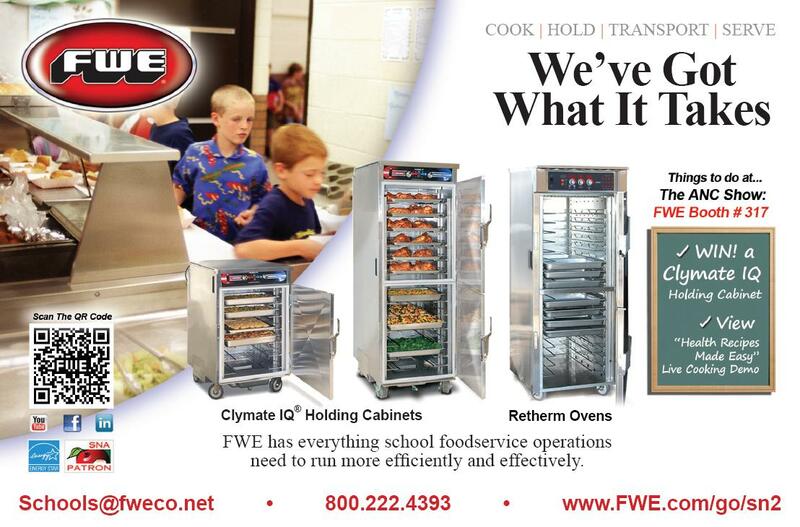 How can FWE products help K-12 foodservice work more efficiently? GF: Having a good rethermalizer and good holding cabinet are key to every K-12 operation. It’s essential to get the quality food out. FWE can look at a district’s menu and help fit the right piece of equipment to meet the district’s needs. 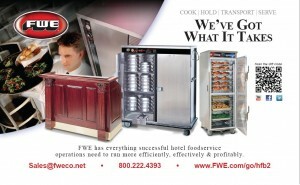 FWE has the right staff to ensure you’re going to get a quality product. 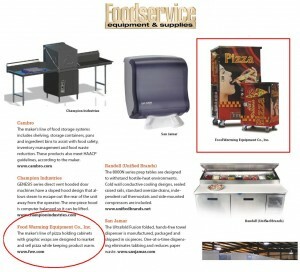 Call (800) 222-4393 to speak to a School Foodservice Professional. 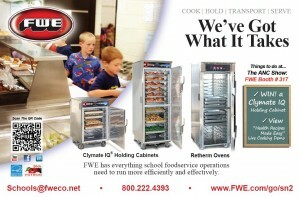 FWE / FOOD WARMING EQUIPMENT COMPANY, INC.
As seen in the School Nutrition Association’s ANC Conference Guide – FWE has Got What it Takes for school foodservice operations to run more efficiently and effectively. 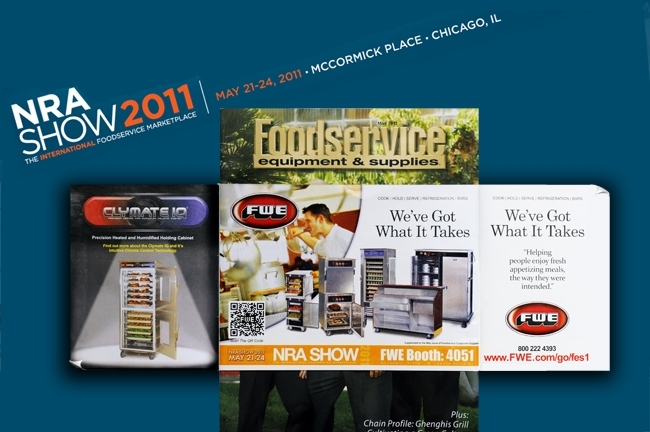 Stop by the FWE Booth #317 at ANC this year to enter to win a full size Clymate IQ Heated & Humidified Holding Cabinet as well as view Live Cooking Demo’s featuring OSP from the “Healthy Recipes Made Easy” webinar series. 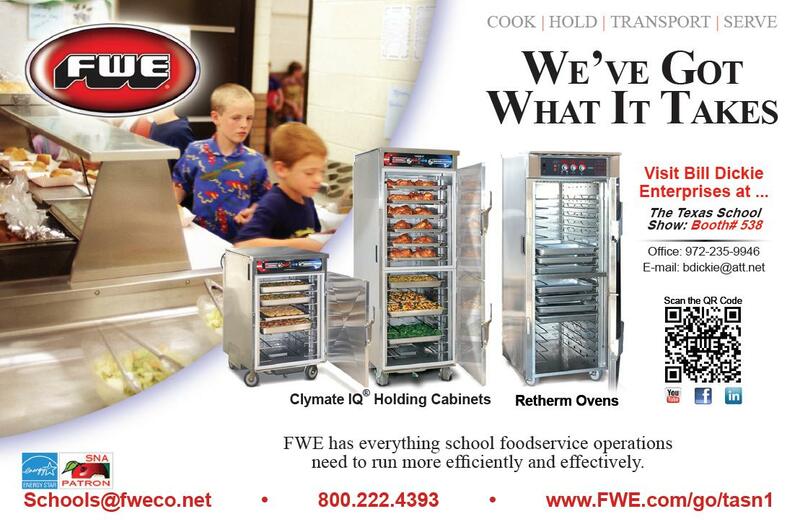 FWE’s Clymate IQ® Heated and Humidified Holding Cabinet and Retherm Ovens help schools prepare and serve hot meals on time. FWE Retherm Ovens prepare large volumes of product and serve has a holding cabinet once the food has reached the set cook time or temp by use of an automatic hold feature. Operators load product and are free to walk away until they are ready to serve. 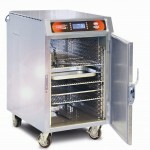 FWE Retherm ovens are available in a variety of sizes for use with trays, pans, baskets and roll in rack applications. 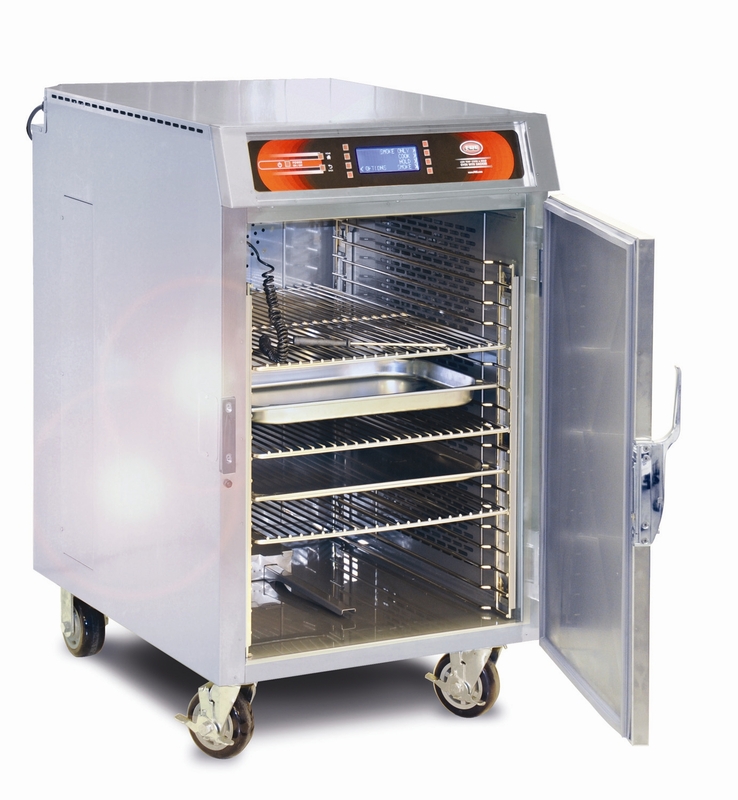 The FWE Clymate IQ® Heated and Humidified Holding Cabinet keeps food at optimum serving temperatures through peak serving periods. Portable and easy to use, it is perfect for short-term staging and extended holding times, eliminating hot and cold spots with minimal operator involvement. 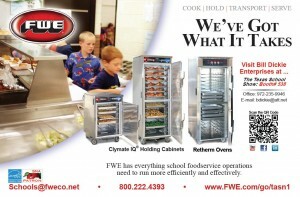 As seen in the annual Texas Association for School Nutrition’s (TASN) conference guide, FWE has Got What it Takes for school foodservice operations to run more efficiently and effectively. 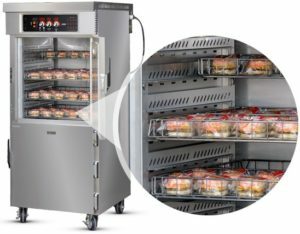 Stop by Bill Dickie Ent’s booth at this years Texas School Show Booth #538 to learn about FWE’s Clymate IQ® Heated and Humidified Holding Cabinet and Retherm Ovens that help schools prepare and serve hot meals on time. 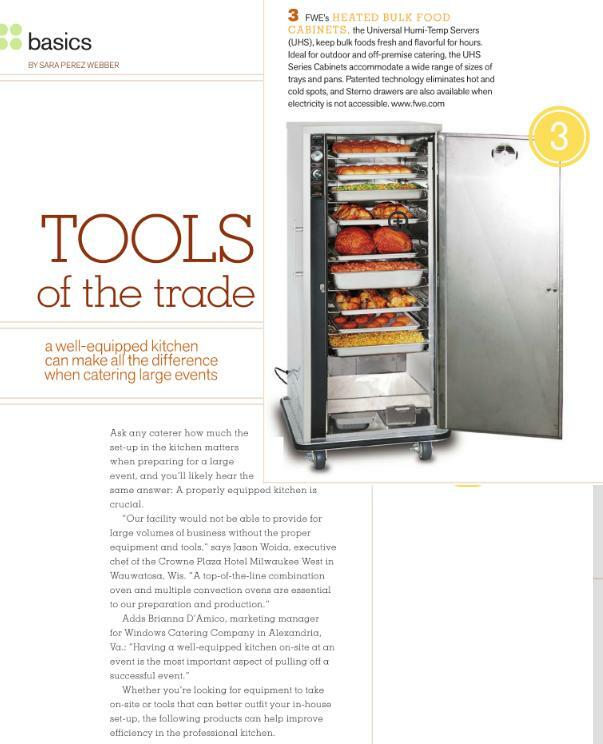 FWE Heated Bulk Food Cabinets are Part of the Caterers "Tools of the Trade"
As seen in Catering Magazine’s May/June edition “Tools of the Trade” article, FWE Heated Bulk Food Cabinets add to a properly equipped kitchen for caterer’s. The Universal Humi-Temp Servers (UHS), keep bulk foods fresh and flavorful for hours. 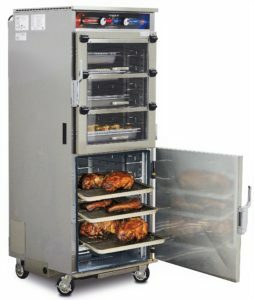 Ideal for outdoor and off-premise catering, the UHS Series Cabinets accommodate a wide range of sizes of trays and pans. Patented technology eliminates hot and cold spots, and Sterno drawers are also available when electricity is not accessible. Posted on May 23, 2011 Author adminCategories MagazineTags caterers, catering, Food Warming Cabinet, Food Warming Equipment, FWE, Heated Cabinet, Heated Holding, Heated Holding Cabinet, Heated Holding Cart, holding cart, mobile heated holding cabinet, uhs, uhs seriesLeave a comment on FWE Heated Bulk Food Cabinets are Part of the Caterers "Tools of the Trade"
As seen in the Products section of the May issue of Foodservice Equipment & Supplies Magazine, FWE custom pizza wraps make holding pizza look good. 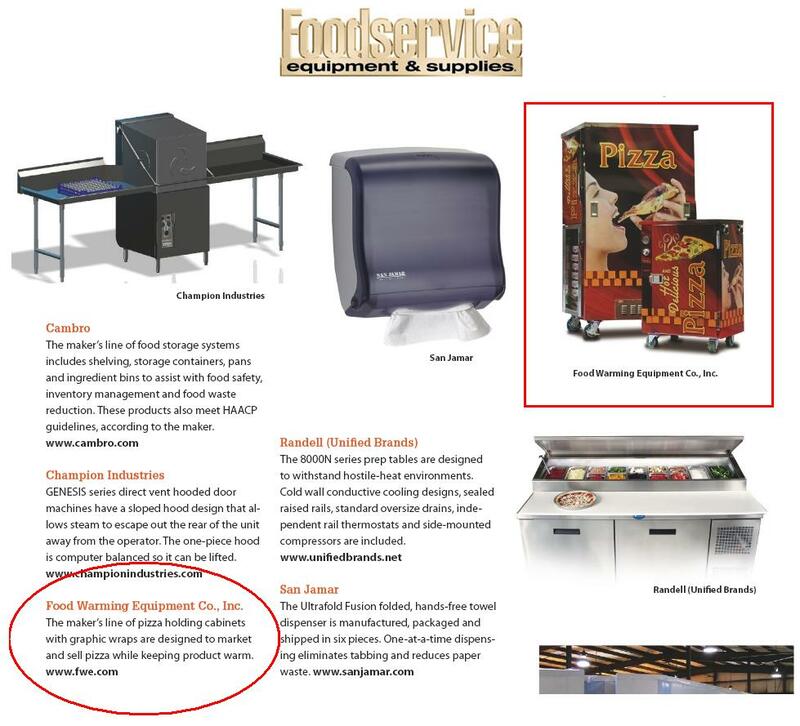 Stop by FWE Booth #4051 and see the custom pizza wraps as well as a variety of equipment from the broad FWE product line. As seen on the May issue of Foodservice Equipment & Supplies Magazine, FWE‘s Got What it Takes at this years NRA show. Stop by FWE Booth #4051 and see a variety of equipment from the broad FWE product line. 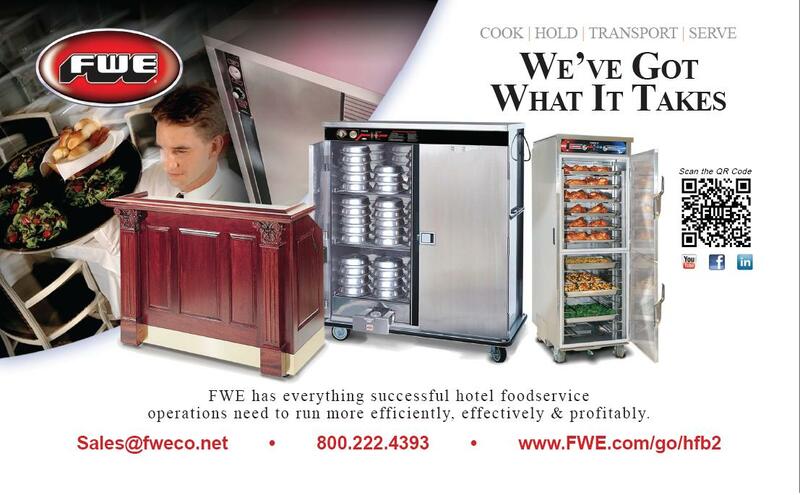 FWE‘s Got What it Takes to run an efficient and successful foodservice operation. 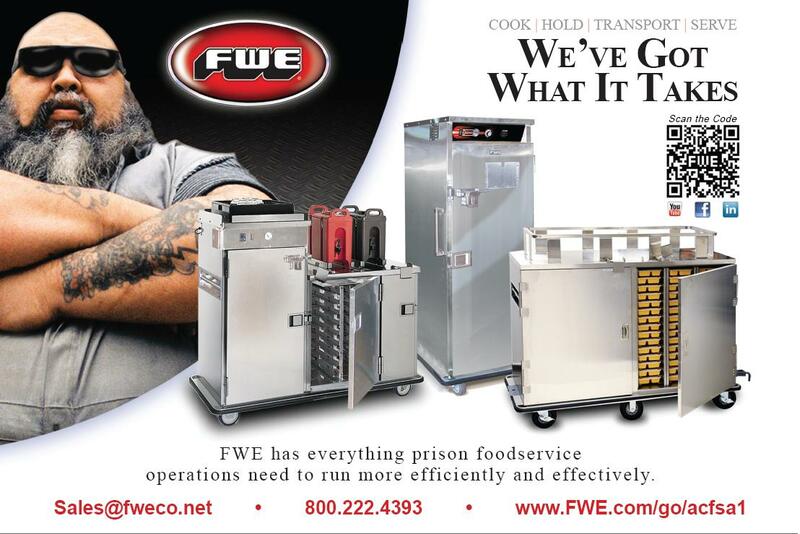 As seen in the May edition of the ACFSA Insider, FWE has Got What it Takes to run a more efficient and effective foodservice operation for Prisons. 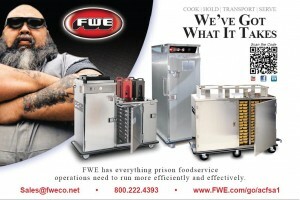 Whether it is bulk trays and pans or inmate compartment trays, FWE builds tough durable equipment to withstand the most demanding environments. Complete with correctional security features, FWE holding cabinets are available with heated, ambient, and refrigerated compartments.